MacMillan & Co., 2003, Hardback in Dust Wrapper. From the cover: “The most distinctive figure in football blows the whistle on the beautiful game. 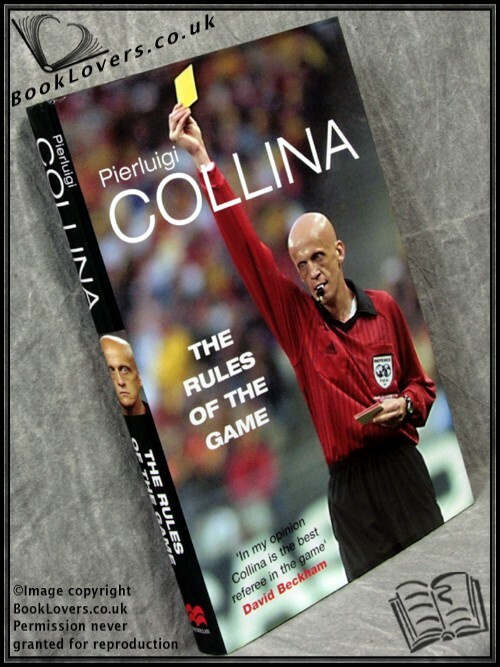 On 30 June 2002 Pierluigi Collina, universally acknowledged to be the world’s finest referee, officiated over Brazil and Germany in the World Cup Final. A matter of weeks later he was back on the field refereeing an Italian Cup first-round encounter between Sampdoria and Siena. From this unique vantage point Collina is perfectly placed to comment on the game, on the stars, on the media and on the matches he has overseen, including England’s World Cup victory over Argentina and Manchester United’s dramatic treble-winning European Cup Final. The Rules of the Game takes us as never before into the world of the referee; the preparation needed for each game, the managing of players and officials, and the camaraderie behind the scenes. Collina describes how it feels to make a difficult decision, the pressures from the crowd and the players, while taking us through the most important, and significant, matches he has refereed. In bluntly honest terms he also describes the emotions that making a potentially game-changing mistake can provoke. Collina explains how he deals with such occasions without losing his grip on the game. But more than anything, The Rules of the Game is Pierluigi Collina’s chance to speak out about the game he loves. With wit and insight, he tackles the issues that have altered and now threaten world football. The role of the media, the influence of big business and sponsorship — Collina is the only referee to have a commercial sponsorship deal — and the culture of ‘win at all costs’ are all targets for his impartial and impassioned views on the modern game. Size: 9½" x 6¼". Black boards with Gilt titling to the Spine. 207 pages.